What Kind of (Digital) Citizen? This post was co-written with Alec Couros and also appears on his blog. This week (June 5-11) we’ll be hosting a couple of events and activities related to digital citizenship as part of a series of DigCiz conversations. Specifically, we’d like to deepen the discussion around digital citizenship by asking how we might move from a model of personal responsibility (staying safe online) to one that takes up issues of equity, justice, and other uncomfortable concepts. That is, we want to think about what it might look like to think about digital citizenship in a way that more closely resembles the way we often think about citizenship in face-to-face contexts, where the idea of being a citizen extends beyond our rights and also includes our responsibility to be active and contributing members of our communities. Of course, that’s not to say that face-to-face citizenship is by default more active, but we would argue that we tend to place more emphasis on active citizenship in those settings than we do when we discuss it in its digital iteration. So…in order to kick things off this week, we wrote this short post to provide a bit more background on the area we’ll be tackling. The cybersafety approach is problematic for a number of reasons. We won’t go into them in depth here, but they basically boil down to the fact that students aren’t likely to see PSAs like this one and then decide to go off the grid; the digital world is inseparable from face-to-face contexts, especially for today’s young people who were born into this hyper-connected era. So this is where digital citizenship comes in: instead of scaring kids offline or telling them what not to do, we should support them in doing good, productive, and meaningful things online. While the move from cybersafety to digital citizenship has helped us to shift the focus away from what not to do online, there is still a tendency to focus digital citizenship instruction on individual habits and behaviours. Students are taught to use secure passwords, to find a healthy balance between screen time and offline time, to safeguard their digital identity. And while all of these skills are important pieces of being a good digital citizen, they revolve around protecting oneself, not helping others or contributing to the wider community. So we’d like to offer a different model for approaching the idea of citizenship, one that moves beyond the individual. 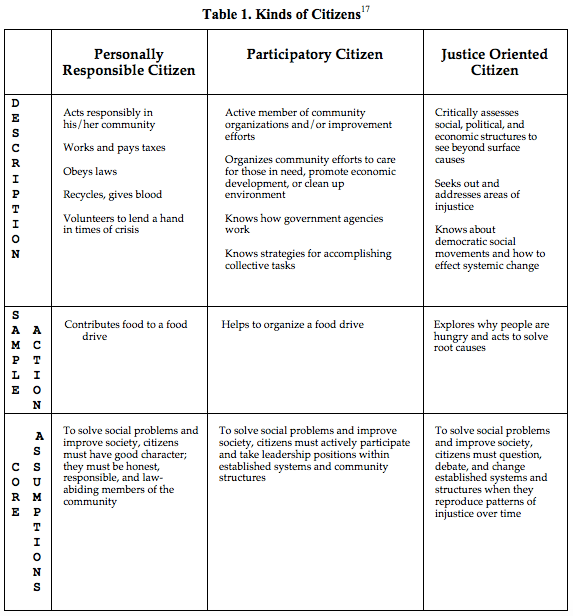 To do this, we have found it helpful to think about citizenship using Joel Westheimer’s framework. Westheimer distinguishes between three kinds of citizens: the personally responsible citizen, the participatory citizen, and the justice oriented citizen. The table below helps to define each type. Table taken from Westheimer’s 2004 article, linked above. 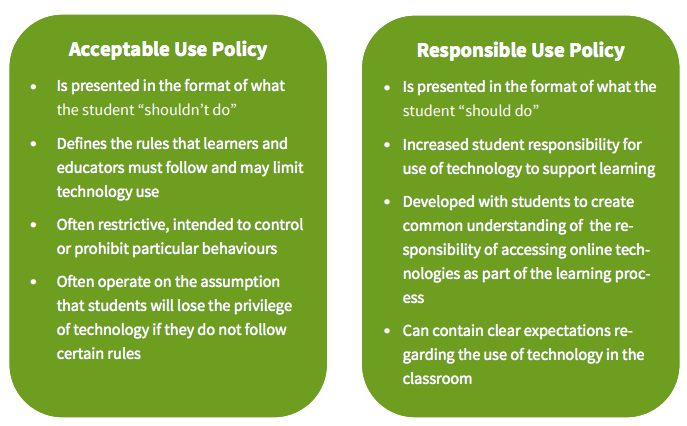 Using this model, we would argue that much of the existing dialogue around digital citizenship is still heavily focused on the personally responsibility model. Again, this is an important facet of citizenship – we need to be personally responsible citizens as a basis for the other types. But this model does not go far enough. Just as we would argue that we need participatory and justice-oriented citizens in face-to-face contexts, we need these citizens in online spaces as well. So here’s our challenge this week: Is there a need to move beyond personal responsibility models of digital citizenship? And if so, how can we reframe the conversation around digital citizenship to aim towards the latter two kinds of citizen? How might we rethink digital citizenship in order to encourage more active (digital) citizenship and to begin deconstructing the justice and equity issues that continue to negatively affect those in online spaces, particularly those who are already marginalized in face-to-face contexts? And what are the implications of undertaking this shift when it comes to our individual personal and professional contexts, especially when it comes to modelling online behaviours and building (digital) identities/communities with our students? These are big questions, and we certainly don’t have the answers yet – so we’d love to hear from you! Please consider commenting/responding in your own post, or come join us as we unpack these complex topics during the events listed below. On Tuesday, June 6 at 3 pm EDT, we will be hosting a webinar to discuss this week’s topic. If you are interested in being a panelist, please email us at alecandkatia@gmail.com – we’d love to have you join us! The Webinar will take place via Zoom.Us – to join as an attendee, just click this link. On Wednesday, June 7 at 8 pm EDT, we will be moderating a Twitter chat with a number of questions related to this week’s topic. To join, please connect with us on Twitter (@courosa and @kbhildebrandt) and follow the #DigCiz hashtag. This entry was posted in Digital Identity, Education, Pre-serviceTeachers, Social Justice, Social Media, Teaching and tagged active citizenship, digcit, digciz, digID, digital citizenship, digital identity, identity, Westheimer by Katia Hildebrandt. Bookmark the permalink. I like the shifting here. It becomes more civics. More, global in perspective. And potentially more positive. I guess one question that continues to resonate is how do various platforms both encourage and inhibit the kinds of interactions you are talking about. It’s one thing to change the language on a document (if kids read those documents) and another to find avenues for engagement and meaning on a level that has intrinsic value for young people. Looking forward to the discussions. Pingback: What Kind of (Digital) Citizen? Digital Citizenship needs to be instilled from the ground up starting at home and throughout schooling. The local, digital and global perspective are essential in this, as is the balance between the negative/danger aspects and the positive/creating/do_good/rights_responsibilites aspects of the Internet. Ultimately, we want people that are well versed with the full spectrum of possibilities the Net provides and use these for personal development and improvement of others locally and globally. I wrote a digcit adventure novel, Team Savv-i: The 10 Sectrets of Cyberspace to make digital citizenship more palatable for young teen readers. The narrative is student driven and provides a good example of how to do good using digital tools. I now believed cozy that he presented an poor hand and was expecting he’d contact.